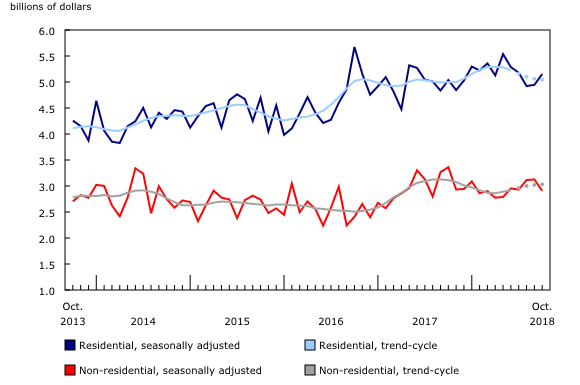 Canadian municipalities issued $8.1 billion worth of building permits in October, edging down 0.2% from September. The decrease was mainly attributable to lower construction intentions for industrial and institutional buildings. The value of non-residential building permits fell 7.0% in October to $2.9 billion. Eight provinces posted declines, most notably British Columbia. In the industrial component, the value of building permits fell 29.9% to $439 million, the third consecutive monthly decrease. Declines were reported in nine provinces, with Manitoba the lone province to post an increase. The value of institutional building permits was down 8.7% in October to $733 million, after posting an increase of 16.7% the previous month. 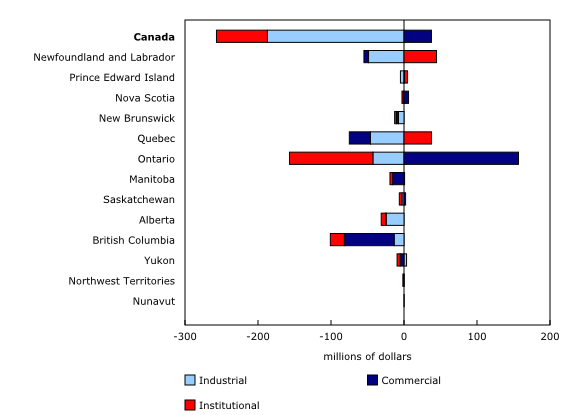 Lower construction intentions for hospitals, post-secondary institutions, and other government buildings were responsible for much of the decrease. In the commercial component, $1.7 billion worth of building permits were issued in October, up 2.2% from the previous month. The gain was mainly attributable to higher construction intentions for office and retail complexes. In the residential sector, the value of building permits increased 4.2% from September to $5.2 billion. Both multi-family and single-family dwellings posted gains. The value of permits for multi-family dwellings rose 3.8% to $2.9 billion. Gains in Ontario (+$222 million) and British Columbia (+$115 million) more than offset a decline in construction intentions in Quebec (-$238 million). The overall increase was driven by higher construction intentions for apartment-condominiums. In the single-family dwelling component, municipalities issued $2.3 billion worth of building permits in October, up 4.6% from September, the first increase in five months. Municipalities approved the construction of 20,017 new dwellings in October, up 4.1% from the previous month. The increase stemmed from both multi-family dwellings, which rose 4.7% to 14,965 new units, and single-family homes, up 2.2% to 5,052 new units. The total value of building permits was down in five provinces in October, with Quebec recording the largest decline. However, the value of building permits rose in 22 of 36 census metropolitan areas (CMAs), led by Toronto. 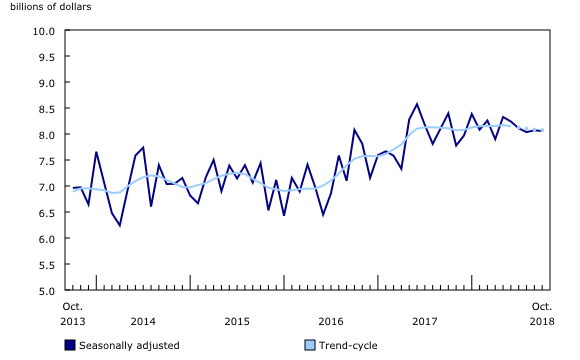 In Quebec, the value of building permits was down 14.8% to $1.5 billion in October, following a record high in September. The decrease was largely the result of lower construction intentions for multi-family dwellings, primarily in the CMA of Montréal, where the value of permits fell 39.3% to $314 million. In contrast, the value of building permits in Ontario was up 9.4% in October to $3.3 billion. Increases in both the multi-family and commercial components contributed to the rise. 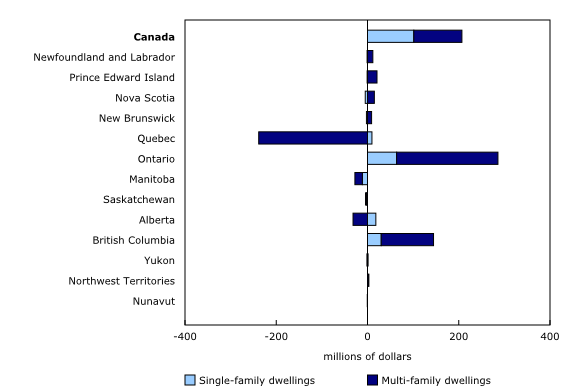 The value of multi-family dwelling permits in the CMA of Toronto rose 37.5% to $854 million—the second highest level on record. The gain was mainly the result of several high value permits issued for apartment-condominium buildings. The tornadoes that hit Ottawa and Gatineau on September 21 had a notable effect on the number of demolition permits issued in the Ottawa–Gatineau CMA in October. On an unadjusted basis, the demolition of 70 residential units was approved in the Ottawa part of the CMA, with approximately 20% of these demolitions related to the tornadoes. Meanwhile, the demolition of 84 residential units was approved in the Gatineau part of the CMA in October. Over 70% of these units were in the Mont-Bleu area. Data on building permits for November 2018 will be released on January 10, 2019.